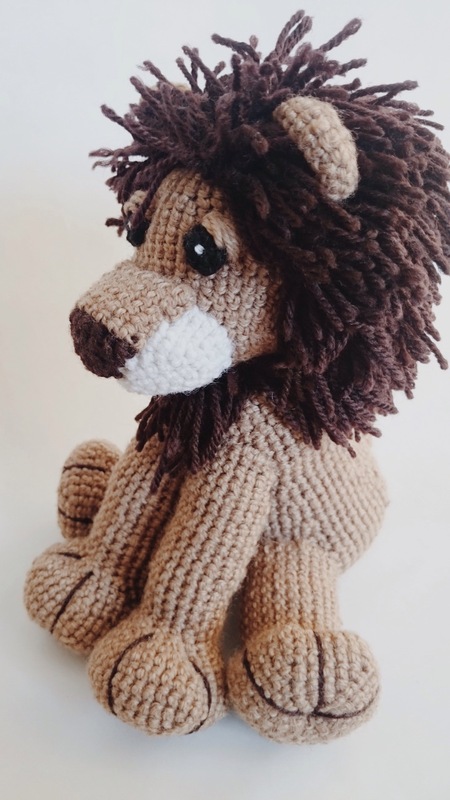 I am currently making your lion and he is soooo much fun! Thank you thank you for this pattern I wouldve paid for such a great pattern. The pattern is amazing and I am going to start in my Lion today. Thank you so much. Hi Kat, the mane cap should fit snugly on the lions head. If you’ve followed the pattern, I’m not sure where else it went wrong. It’s been a while since I’ve done it. Can someone who has done it already help us out please? Sorry that I couldn’t help you. But the rest of the pattern is beautiful. Love it so much. Par contre je comprend pas le sens a mettre sur la tête les 2 petites bosses , peut-être sur le devant pour relever la crinière ? I made the cap with a larger hook, I think a couple sizes bigger, and it was just right. This pattern is ADORABLE. I am loving making this for my nephew! I am working on the mane and I noticed it goes from round 8 to 10, is round 9 omitted on purpose? Thank you for all the hard work you did creating such an amazing pattern! Do you have this pattern available in a pdf? It is adorable. Hi, I’m also confused about the mane cap. Someone commented that row is omitted.Maybe that extra row of sc would help make it a bit larger? Anyone else try this, or have a solution to make it a big bigger? And I’m not sure which way to put the cap on the head. Do the pointy parts go back to front, or side to side? I had a lot of success with the rest of the pattern, but I’m a little stuck here! I don’t know if my previous comment went through. Did anyone have any luck figuring out the mane? I agree that it turns out way too small. I would think it’s supposed to fit like like winter toque (sorry, Canadian here!) but the one I ended up with looks more like a beret… not sure what to do looking for support! Rows 11 – 16 of the head are missing. Such a cute pattern but I need the rest of the rows. Hi, it just means you have to repeat sc 48 stitches around for all of those rows. Hope it helps! Hi! At what rows do you add the muzzle? I used the same size hook for both the head and muzzle but the muzzle looks too big. Khrysten I was wondering the same thing. I’m with you the muzzle looks too big. Right now I’m making all the parts then putting it together. Right now I guess I will figure it out when I go to put him together. Hope you were able to figure out where to put your muzzle. Josephine Blankenship you do not close the head and body. You leave them open at 18 sc. I have a lot of patterns that are open like this. You just sew the head on top of the body. Thank you for sharing this pattern. Can’t wait to make one for my Lyon family! You do not say size of yarn? I just finished this and it turned out beautiful! Took awhile, but I absolutely love it! Thanks for sharing this pattern. hi I was wondering why row 11-16 aren’t there? Hi! How did you do the lion feet stitches? It looks to be embroidered with yarn(? Or is it embroidery floss? ), but I’ve never done one of these before so I wanted to make sure. Thanks for the help! Thanks for asking, i’ve used needle and yarn to embroider the paws. Hallo! Ich finde den Löwen wirklich sehr schön. Leider weiß ich nicht genau wie das mit der Mähne gemacht wird. When you use a : does that mean you repeat that row until your next instruction? Head round 10 skips to 17. Mane skips from 8 to 10. Legs skip from 12 to 20. Arms skip from 13 to 26 . Thanks for asking, yes I meant that there’s no increase or decrease and you should repeat the Row. Hi. I am about to start my lion for my granddaughter, but I had a question. Do you happen to recall what brand of yarn you used? I know the type I use is entirely up to me, but I have to order it online and it is easier if I can estimate yardage and not buy too much. Thanks in advance. Hi Peggy, thanks for asking. I live in Australia and I used the Acrylic yarn from Lincraft. It was a 8ply yarn, and finished the whole lion with one skein. The mane needed a little bit more than one skein of brown yarn to make it appear voluminious. Hope it helps. Thank you! I’ve started this little guy, and I can already tell that he’s going to be a cutie! Hi! I wanted to ask the patternmaker this question, but I have to get this done soon. Did you make the Lion? And the feel is so hard. Is it supposed to be? I imagined it soft and baby feel. I’m making my first lion with your pattern. It is for my best childhood friend’s grandson. I’m going to put a fuzzy stick in the tail so it can be posed. Thought it might be a cute touch. I love the pattern. 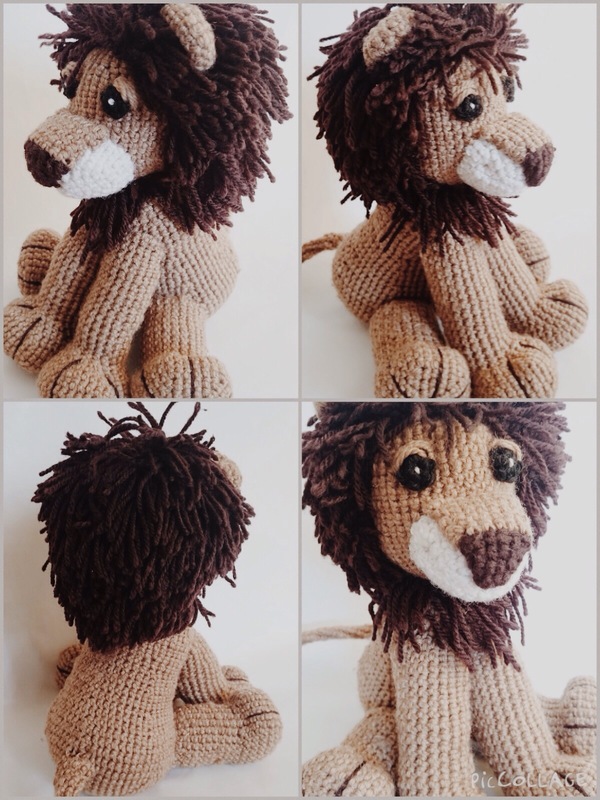 My name is Lupe and I fell in love with the Lion pattern so am going to make one for a new baby. Wow this pattern is fantastic…mine came out perfect and cant wait to give it to my grandchild when he/she arives next year. Thanks so much for sharing !! I love the pattern. I have started with 4 ply acrylic and the size crochet hook you recommended. My magic circle is perfect!! in feel. Is it supposed to be? I was thinking a soft little lion. The stitches are very tight, giving my lion a sandpaper texture. HELP! I’m afriad that the lion is not a squishy toy, however it softens over age. Thanks for asking Roberta.